"The Bougainville Women’s Federation is a representative body and the voice for all women of the Autonomous Region of Bougainville." The Bougainville Women’s Federation (BWF) through its Young Women’s Leadership Project hosted its forum with the theme BREAK THE SILENCE!Hear Our Voice! Held from the 23nd -25th of October 2018 at Marimari House, Arawa, Central Bougainville. 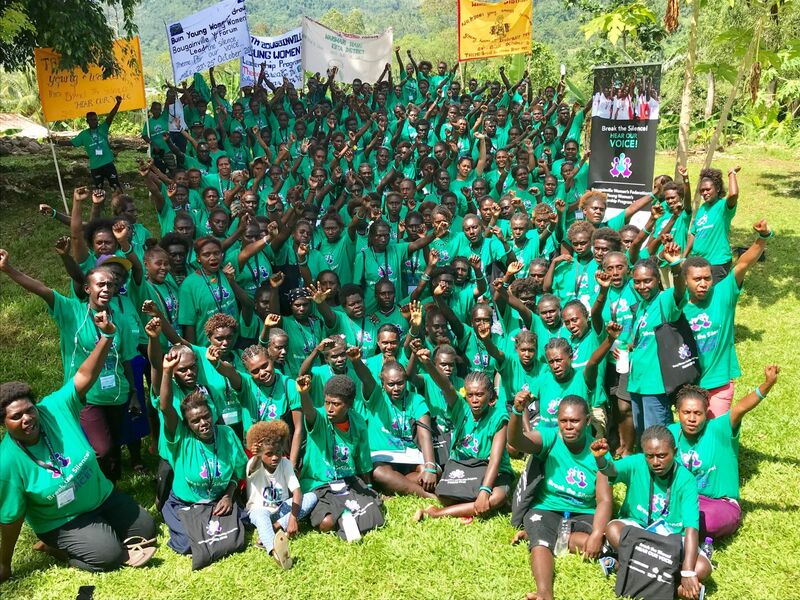 Over 150 people attended the forum, including young women from North, Central and South Bougainville, young male advocates, mentors, and guests from Papua New Guinea, Solomon Islands and Fiji. The forum opened with a speech by Henrietta Sinei, President of the Young Women’s Caucus. Henrietta delivered a powerful speech reflecting on the progress of the young women as a direct result of the Young Women’s Leadership Project (YWLP) and the ongoing work of the district Young Women’s Associations. Henrietta is the first ever young women to be elected to the Bougainville Women’s Federation (BWF) executive council. This was followed by a speech from Ruby Meringka of the Bougainville Referendum Commission. Two pawa meri’s spoke to the forum participants, including Florence Nanai (BWFfinance manager) and esteemed guest Mavis Podoloko from the Women’s RightsAction Movement in Solomon Islands. They spoke about their journey to become strong and successful young women in their communities, both having participated in leadership programs. Some other highlights during the three days included lively debates between districts on topics from teenage pregnancy, lack of youth employment and young women’s leadership, updates from district Young Women’s Associations,highlighting the leadership positions young women have taken up and the businesses and projects they have started. This year also saw guests from Fiji, Solomon Islands, Voice for Change (Jiwaka),Wide Bay Conservation Association (East Pomio, ENB), YWCA (Port Moresby),Eastern Highlands Family Voice and International Foundation for Electoral Systems. They each shared information about their respective organisations and programs. The guests and young women from Bougainville exchanged ideas and learning with each other, building networks of young women leaders across the Pacific. A young woman participant from Buin district spoke about how she has seen a positive change in her community’s attitudes towards young women in leadership positions. She herself has taken up leadership positions including on the Tourism Association Board, as well as starting her own fishing and sea cucumber business and printing business. She attributes some of her successes to the skills learnt from the YWLP, and by learning to believe in herself and her abilities. Jean Jano, from Eastern Highlands Family Voice,an observer of the forum stated “I was really impressed at the leadership skills the young women portrayed, there were certainly challenges, however the young women were very confident and know that they need to speak their mind.The young women asked lots of questions and were empowered to speak out and this shows the positive impact of the YWLP. This result is a milestone for PNG young women and I hope this type of program that increases confidence and the ability to stand up and speak out is available for all young women and girls across PNG”. Another highlight was the march from Arawa hospital to Marimari centre. In a sea of green t-shirts, the young women marched and spoke out with loud unified voices. Young male advocates and guests marched alongside the young women leaders in solidarity. The young women developed key messages based of identified issues within their districts and created posters to use in the march. Some of the messages included ‘Break the Silence! HEAR OUR VOICE’; ‘Stop suppressing young women, hear our voice’; ‘Stop Violence Against Women’; ‘Empower Young Women’; ‘We need young women in parliament’. On the last day of the forum the young women broke into district groups and developed action plans for 2019. The YWLP is due to end in December 2018, however the young women are motivated to continue the work they are doing without donor funding. Young women alumni from Northern Bougainville have already been trained as trainers. This week, more young women from South and Central Bougainville will be trained as trainers in leadership and good governance and financial literacy. They plan to fundraise and continue training others in their community, with the ongoing support of the District Women’s Federations and Bougainville Women’s Federation. The Bougainville Women’s Federation is a representative body and the voice for all women of the Autonomous Region of Bougainville. The Bougainville Women’s Federation is focused on promoting and coordination of women’s groups, through empowerment and advocacy practices whist working in partnership with the community in peace building. BWF is also focused on empowering and strengthening women’s leadership to ensure equal participation in all decision making at all levels and sectors of the society. Since 2016 the Young Women’s Leadership Project (YWLP) has developed young women’s confidence and leadership skills, and provided the opportunity for young women leaders to take on leadership roles in their communities, initiate business and livelihoods projects, and voice their needs and concerns directly to decision-makers in communities and in all levels of government. The program works with young women in four districts of the Autonomous Region of Bougainville, as well as alumnae from the pilot phase who have since become trainers. The Young Women’s Leadership Program is supported by the Australian Government in partnership with the Government of Papua New Guinea as part of the Pacific Women Shaping Pacific Development program, and supported by the International Women’s Development Agency.